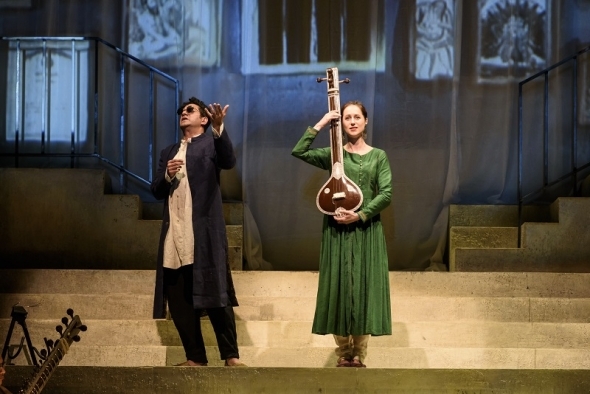 ONE OF THE HIGHLIGHTS of Alchemy 2017 was the London premiere of Ravi Shankar’s Sukanya the Opera. It begins with a lone man sitting up some steps on stage playing sitar and then a shehnai (a classical wood instrument) comes in. The libretto by Amit Chaudhuri begins with homage to the power of love and desire. Lo and behold it is a sage in contemplation. “Before you came even these ants didn’t disturb me. “My bones are old, my skin is old, my history goes back” cries the irate sage, who has now been inadvertently blinded by the Princess. The sage is Chyavana, (Alok Kumar) and they are married. There is a backdrop of projections and dance while dancer, Rukmini Vijayakumar is spellbinding to watch while the shehnai played by Ashwani Shankar is haunting. Sung beautifully by Hurrell and Kumar in the lead roles, this is basically a love letter by Ravi Shankar to his wife, Sukanya and also a lesson in Indian music versus western music. The singing and dancing were great to watch, the words a tad simplistic and the music performed by the London Philharmonic Orchestra conducted by David Murphy, is powerful, blending the experimental nature of Indian and Western music. That music was first composed by Ravi Shankar in his life while the director of ‘Sukanya’, Suba Das adopts a playful attitude to the whole project. The second act begins with the back wall of the stage projecting several images of Ravi Shankar and the sound of the shehnai, where Chyavana, the blind hero is giving a lesson in music to his wife — echoes of Ravi Shankar teaching daughter, Anoushka, perhaps and sharing some of his own personal history. This evening was an event and enjoyable as that. The mood of the music ranged from the energetic rain falling in the beginning to contemplative to romantic and according to the cognoscenti, it reminds them of the sheer range of Ravi Shankar’s oeuvre. ‘Sukanya’ was performed as part of Alchemy’s opening on May 19 and first premiered at the Leicester Curve Theatre on May 12 and was in Manchester and Birmingham, before coming to London.